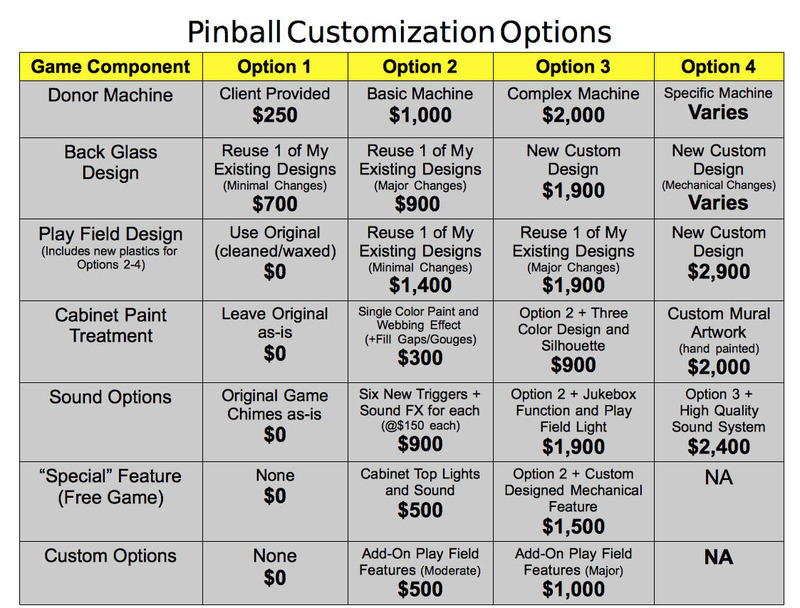 It is very unlikely that someone will actually try to order a custom-designed pinball machine from a form on a website. That would be nice, but let’s be realistic here. You are essentially commissioning a piece of art, as well as a mechanical restoration of sorts, and you probably want to discuss some ideas, talk about expectations, time frames, how much input you have in the design process, etc. …and of course the costs. New pinball machines: $5,000 – $10,000 per game. Typically ~ $8,000. Obviously, as an artist, I believe there is value in the creativity and artistry behind each component of the project where those skills are leveraged. With that in mind, the most expensive (priceless?) parts of the project will be in those components. The price list above is what I am starting with. My hope (and belief) is that I will get a few orders, start to gain a reputation as a unique kind of artist, and let the laws of supply and demand dictate my pricing. 1. If you have a working machine, I can use it as the donor machine. I will charge a fee of $250 if you choose this option to cover the basic costs of new rubber bumpers, bulbs, cleaning, and adjustments. 2. I have several available machines I can use as the basis of your project. I have a page on this site where I list the available machines and features (Donor Machines Available for Customization). The costs for the donor machines will range from $1,000 to $2,000. That cost will include repairs/new components, new legs, new rubber bumpers, etc. 3. You can also save money if you like one of my existing designs and you simply want me to adapt it to fit the donor machine. See the options that say “Reuse 1 of My Existing Designs” above. The costs are about half of what a new custom design would be. 4. For new custom work, several design choices will be provided for each major piece of work (back glass, play field, cabinet, mechanical options, sound FX, etc.) as the project progresses. So there you have it. If you do the math for all the possible options, you can see that the total price can range from less than $1,000 up to about $10,000 for almost all the options. I expect most projects to fall in the $5,000 to $8,000 range- and that compares favorably with the researched prices listed above especially considering that you will be receiving a one-of-a-kind piece of playable art. Call me at 401-212-7500 if you have questions or would like to discuss options. I will complete jobs in the order received. It may take several months to fill each order. Thanks for even considering investing in one of my creations.